● Monday 1 February: 12 Angry Men (1957), concerning the jury of a homicide trial. It is introduced by Dermot Manning, a film buff and a barrister who specialises in tort and personal injury law and Assistant Editor of the Irish Reports. ● Monday 8 February: Citizen Four (2014), a topical documentary about Edward Snowden’s revelations of the abuse of power and trampling of privacy rights by intelligence agencies around the world. It is introduced by Dr Thomas J McIntyre, Lecturer in Law, University College Dublin, where he specialises in issues involving information technology law and civil liberties. He also chairs the independent civil liberties group Digital Rights Ireland. His PhD thesis at the University of Edinburgh was on the topic of internet filtering law and governance. 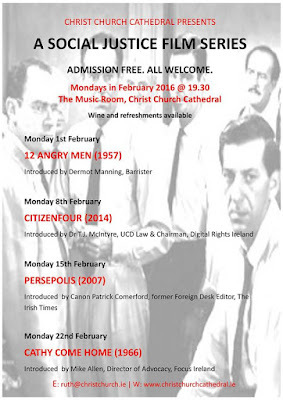 ● Monday 15 February: Persepolis (2007), which I have been invited to introduce. This film is based on Marjane Satrapi’s graphic novel about her life in pre- and post–revolutionary Iran and then in Europe. 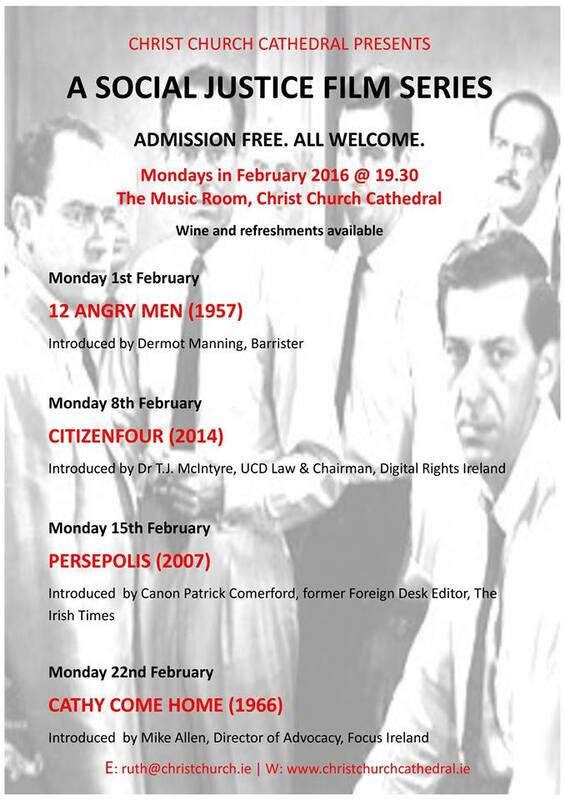 ● Monday 22 February: Cathy Come Home (1966), introduced by Mike Allen, Director of Advocacy, Focus Ireland. This is an iconic 1960s film about homelessness and was directed by Ken Loach in a gritty documentary style. Admission is free and all are welcome. There is no need to book and wine and refreshments are being served each evening.